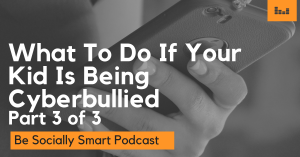 Today’s episode is the last in our 3 part series on cyberbullying. In part 1, we identified exactly what cyberbullying is and talked about the different forms that it can take in the digital space. In part 2, we then discussed some key indicators that can help parents to spot online bullying issues with their own children. But what should you do if your kid is being cyberbullied? In our final cyberbullying conversation, Caleb will share some straight forward, practical solutions that you can implement your own home. If you know or suspect that your kid is being cyberbullied, be sure to tune in today. Have any additional thoughts or questions on cyberbullying that we didn’t cover in this series? Reach out and let us know!